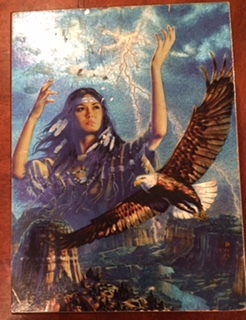 My Native American wood box that I’ve had since 1994 when I began reading. Click to read each part of this original series by Ronnie Allen Ph.D.
Good health is the optimum relationship one forms with their body and mind within their environment. An individual needs to know how to improve and work with his or her health patterns, which includes both strengths and weaknesses. If you think of the word disease and break it into syllables, disease, you will see what the word means. Disease comes from dis ease of the body on the physical, emotional and spiritual levels and metaphysically illnesses settle in parts of the body that are in stress. These are weak areas of the body which are caused by genetic, as well as developmental or environmental factors. Our health is our choice. We can’t change the past. But we can change the future. Our parents training or values and belief systems does not have to be ours. People go over childhood traumas and wounds as if they happened yesterday, being completely overwhelmed and controlled by them. I try to empower my clients how to be the one in control. There is no ownership of behavior and the feeling that one can make a difference in their own quality of life. When many of our clients come to us for a reading they come viewing themselves as victims; victims of abuse, victims of drugs, victims of lack of love, victims of societal pressures. Many of our clients feel that they are not good enough or worthy enough to be capable of making a change. They come wanting a quick fix. These belief patterns will eventually wear them down and cause illnesses in the metaphysical counterparts of their bodies. I use the Tarot as a Tool of Empowerment to help people realize that they can seek out alternatives and accept responsibility for their thoughts, feelings and actions. Empower means to give power or authority to enable or permit. When you are empowered you eliminate the self-defeating attitudes, and burdens that come along with it. You project an aura of strength which enables you to make choices and take educated risks without fear. Life is trial and error. Not everything we try to accomplish will come our way easily or at all. An empowered individual can deal with the good and the bad while having the inner strength and ambition to change self-destructive behavior patterns while seeing all the possibilities for their life. I particularly look for spreads that help assist in this. I have found some exceptional Tarot spreads to use when empowerment issues arise in readings. The first and the focus of this article, is in the text accompanying the Cosmic Tarot by Norbert Lösche. (1988 F.X.Schmid, Munich, Vereinigte Münchener Speilkarten-Fabriken GmbH & Co. KG. ISBM 0-88079-699-5), written by Jean Huets, the Cosmic Pentagram Spread. I will discuss other spreads in subsequent articles. This spread is particularly beneficial because it shows alternative paths that can be taken and they stress action. Action must be taken on the part of the querent to make successful changes. Thinking does not do it alone. Along with the readings I give my clients a writing assignment to do as a follow up. This is the first step in them taking positive action. I like to have my clients leave with a strategy to enable them to attempt something new. The Cosmic Pentagram Spread is based on the pentagram and on the rose on the back of the Cosmic Tarot Cards. The first five of the 11 cards are laid out in the order one would use in drawing a five star pointed pentagram. This card clarifies the issue of the reading. It states the intention, the way in which the querent would like to see the situation resolved. Reveals the powers that have led to the situation. Circumstances or people that the querent feels rules us or the situation. Possibly it’s childhood events. Factors of our personalities that have created the situation. Paired with card 5(Internal Influences) reveals sources of inner strength and insight. Paired with 2 (External Influences) indicated what action we can take. Paired with card 3 (Hope) reveals factors that can be of assistance to us in the situation. Paired with card 4 (Fear), this card indicates inner blocks, sometimes perceived as external obstacles, that prevent the situation from being resolved favorably. Card 10 takes us beyond the intention shown in card 1, beyond immediate needs and greeds. Now that the situation has been analyzed through the reading, we may have a more open mind about what we can accomplish. In the center, this card shows the results of the factors indicated by all the other cards. The last card is a scenario that has been generated by the possibilities shown in the spread. This card should be viewed with the Intention and Aspiration cards. If the Outcome isn’t favorable, conflict among the three cards may gives clues to the source of the problem. Card 1 is the focus of the reading and what is presently on the querent’s mind. Many times clients come wanting to work with a more superficial issue, but a more repressed element comes up. When it does, it is a little more difficult to deny. Whatever theme arises, it is the focus of the spread. Since this card shows what the client wants to achieve, one strategy I use is to envision the goal already met. Feel it, taste it. Want it with a passion. Then we think of the steps to take to get there. Our options are many and actually the latter is the easiest to accomplish. Very often clients blame others, their past, for their inabilities to cope with the present. Card 2 will bring out where the problems originated from the client’s perspective. I ask my clients several questions which we discuss during the session and they can complete in writing after they leave. How does holding on to this particular belief, help or hinder you? How would you feel if you let go of this belief? By holding onto this belief how do you feel you’re protected? How can you get more pleasure and avoid pain by getting rid of this old belief? For the Hope card, 3, how can we take what the card is showing and turn it into reality? What do you have to do, and stop doing? Card 4 we discuss how the clients fears are self imposed obstacles. How is that preventing happiness and feelings of success? Card 5 focuses on Internal Influences of our personalities. Some people may say, I’m too shy and introverted to try that I can’t control it. I just blow up first. Both of these can be destructive as you can imagine. By learning about ones challenges, one can think about alternatives to get around them. We try to think about what can be done in positive terms. What can do you to make changes and have fun while you are doing it? Card 6 awakens the querent to see that they really have what it takes within them to make changes. That’s why I like this spread so much. It gives encouragement to the querent to alleviate insecurities. Card 7 is more obvious. It gives options. Card 8 may reveal support systems that the client has who would be able to help them. Very often we need experts and advisors to make changes. Here, professionals come up such as doctors, lawyers, investment brokers. Since what we do is non medical, we can never recommend not to see a doctor or advise to stop taking medication. Sometimes a spouse comes up, and the querent is unaware that the other person is indeed approachable. We discuss ways of constructively opening up the wave of communication. Card 9, dealing with obstacles, shows us if what the client perceives is internal or external. Is the job closed off because the client does not have the educational background? Or is it closed off because the client is too introverted to go on an interview? The outcome is the same. The client has not acquired the job, but the reasoning is quite different. We can deal with both. Finding a school or program to get the qualifications, or talking about interviewing skills, and how to practice to build up confidence. We talk about how not getting the job is worse than going through any changes. Also, how getting the job would make every aspect of their life better. It’s mostly concerned with freedom: freedom from abusive relationships, freedom from financial burdens, freedom from an uncomfortable job situation. We talk about changing ones reactions from negative to positive and how the situation can be turned into a learning experience to move forward in their life. To reach the Aspirations in card 10, we talk about strategies that can be done in daily living. If income is the issue, and the client wants to improve their abundance we talk about ways I ask them to write down what they can do to increase income, increase finances and enjoy the process. By now we have clarified a lot in the reading and the client is much more clear about the path they can take. Hopefully they have gotten through the impediments, or be on the way to breaking down their self imposed barriers. This way they can envision their own Aspirations, card 10. Card 11, the outcome, is what the client makes of the session. Every outcome can be looked at from a positive point of view. Even if it seems negative. What can we learn from this situation so that we can change and do something different to manifest our goals? This spread is excellent because it implies actions to be taken, and leads the reading in that direction. I would recommend it for a beginning Tarot reader as well as an advanced. This is a sample of my point of view in using the Tarot. I do not use it as a fortune telling device. That destroys is original intent. This article was first published in Vol. III No. 5 & Vol III No. 6 of The American Tarot Association Newsletter for Sept./Oct. 1998 & Nov./Dec. 1998 (See my Links page for a link to The American Tarot Association).All rights reserved, Ronnie Allen, 1998. No parts of this article may be reproduced, quoted or used in any other medium without express written permission from its author. 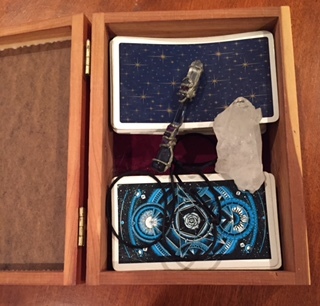 Two decks I use: The Universal Rider Waite, which everyone knows and the Cosmic Tarot, which is no longer available. The Cosmic Tarot has gorgeous cards and is wonderful for relationship readings. I’ll show them to you at the bottom of the second article. I wear a pendant with amethyst, clear quartz and labradorite to increase psychic intuition. The chunk of clear quartz across the decks keeps them cleansed and consecrated. Now you can understand how my characters in Gemini, to be released by Black Opal Books in May, can do readings. You’ll see the antagonist, Barbara Montgomery use them as she plots her revenge, and Dr. John Trenton as he tosses it back to her.